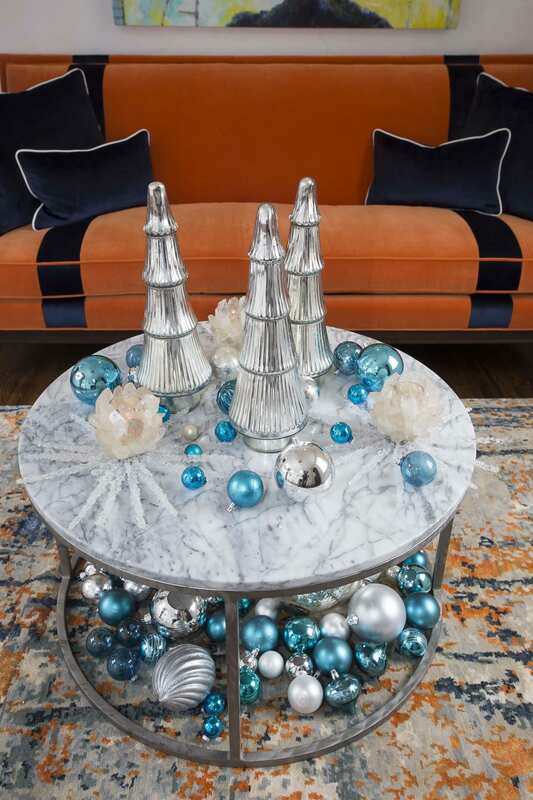 I used arctic blue and silver ornaments, first as a mass under the table, and added a pair of miniature silver trees for interest on top of the side table. I echoed the color scheme with a simple garland I made myself. Note how this color pairing picks up on the colors already used in the room. 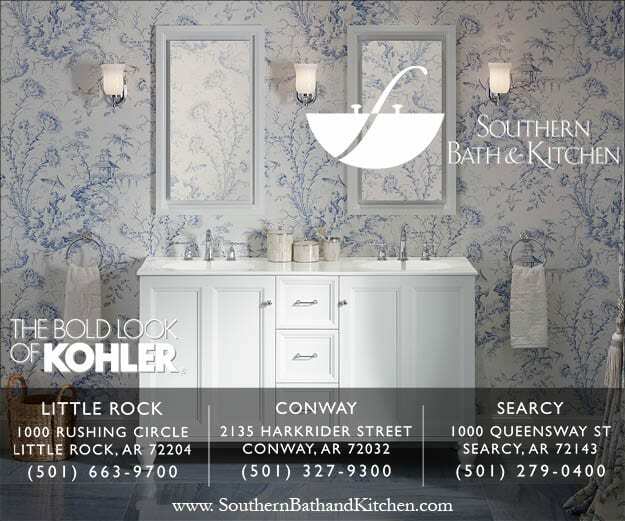 This kind of uniformity also makes the room appear larger. You can’t go wrong with wreaths mounted in windows, no matter your style. You’ll want to limit the color scheme you use for them and then light them. Think about how inviting it always is when you pass by a house at night during the holidays with windows aglow from wired and lit wreaths. This display in its simplicity can be a real workhorse for you. Sort and create your collection along color ways and shapes. 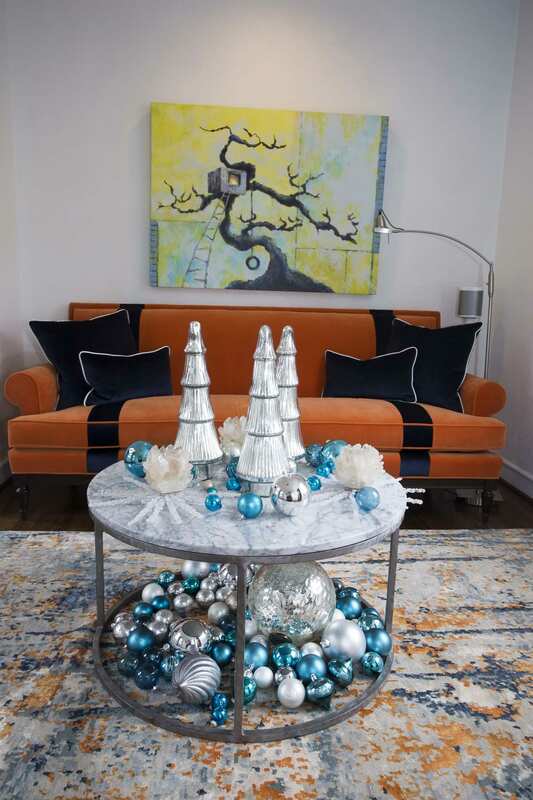 I especially like this look because it complements the existing color scheme in the room. And I love to pile things up because it creates that feeling of abundance for the holidays. 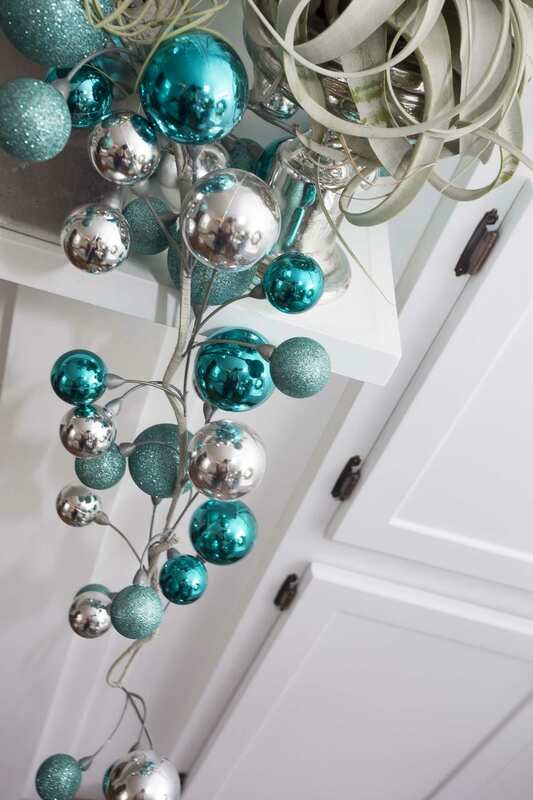 Save your favorite items in your color pairing, and anything with height to it, for the table top, like the silver trees here. Also, because I wanted to continue the theme, I looked around for additions, like these crystal votives. Not only do they work well with the sheen of this table, they’ll create a great glow when lit. I include this shot with the sofa behind so you can see how this cool color pairing complements and also provides great contrast to the sofa and art behind. And it seems effortless for the reason it’s so simple. 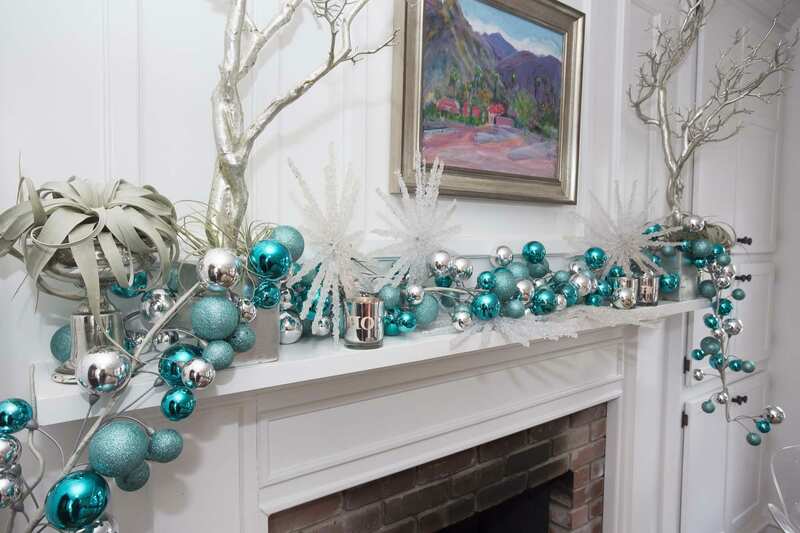 Mantels are your go-to surface for any holiday decorating. But that doesn’t mean they have to be stacked up with Christmas clichés. I love garlands because they convey plenty, can drape from just about any surface, and don’t require lots of elements. All I did here was wire together the same type ornaments I’ve used around the room. No foliage, no lights required. Assembling this kind of wreath can be done by anyone—it’s that simple—and might even be a good way to let children help decorate. All you do is attach an ornament to wire, string that wire along with others and create your length as you go. 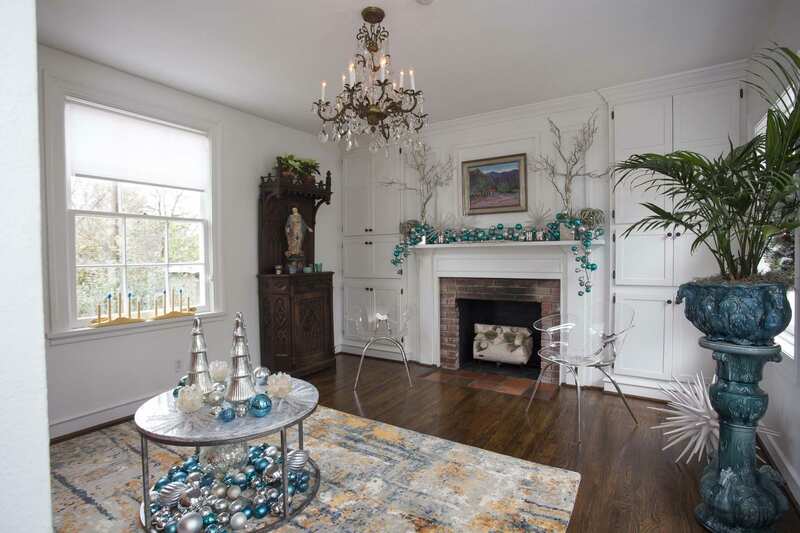 Add a couple of elements for a focal point, then drape, snake, and anchor your garland along the mantel. 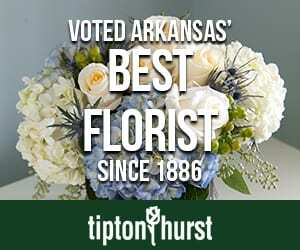 I like tillandsias, also known as air plants, to spill out of containers around the room. And they go great with my cool colors as seen here. It’s easy to personalize your holiday decorating. Just ask yourself what you like, what colors exist in your house, what colors attract you. 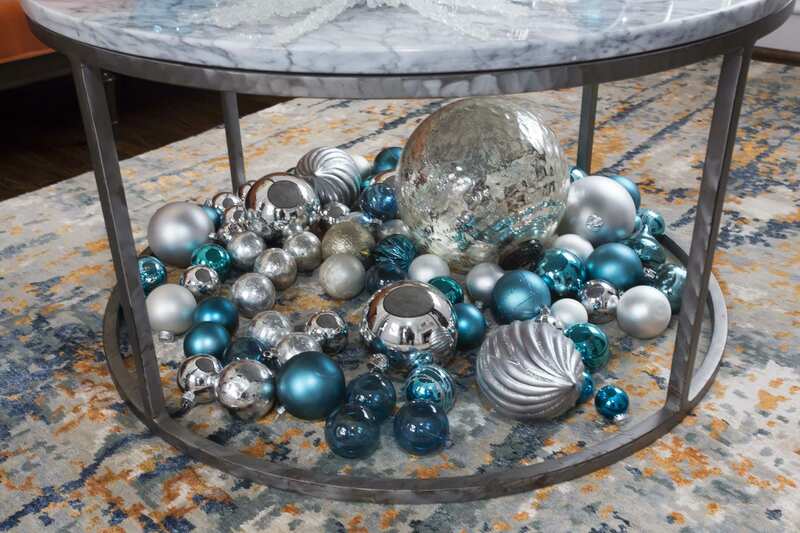 Pick two hues, mass your elements, and incorporate occasional holiday pieces that will echo your color scheme. It doesn’t have to be all red-and-green, Santa, and regiments of reindeer. Use what you like and use it with abandon. That’s what will give your house a real holiday spirit.